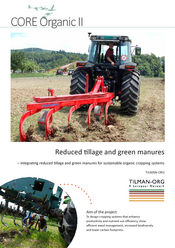 As a conclusion the results of TILMAN-ORG are encouraging not only for organic farmers and advisors to apply reduced tillage and green manures. When applying reduced tillage, green manures are a good strategy to control weeds. Overall, yields were not impeded substantially under an adjusted fertilisation regime, and weeds can be controlled. Further research and development is needed to synchronise nutrient supply and demand, to improve the machinery and to adapt a farm-specific reduced tillage system to keep weeds controlled in the long-term. 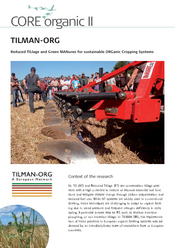 Reduced tillage is advantageous especially for semi-arid regions. Shallow ploughing is recommended in particular in the temperate zone, showing positive effects on soil organic carbon, without compromising yields and without increasing weed pressure. In humid climates, a hybrid system with reduced tillage and occasional ploughing (e.g. for ley destruction or in sandy soils) is promising, but effects on soil organic carbon need to be further studied. Conventional farmers interested in reduced herbicide use may also find our results relevant. For scientists, the expected stratification of organic matter in soils of reduced tillage systems was confirmed. The accumulation of soil organic matter in the topsoil layer improves water infiltration and reduces the risk of erosion. A new research area could be the in-depth analysis of the microbial response to tillage and pre-crops including green manures, which could be managed to optimise nutrient turnover in the future. Also, the identification of functional traits of weeds is a new area that needs further development and can help farmers benefit from within-field biodiversity. In this approach, positive traits of weeds such as serving as a feed source for pollinators or beneficial insects, or negative traits are categorised and quantified for more than 150 weeds. Organic no-tillage systems are promising in Mediterranean regions particularly, where crops can benefit from improved water relations. Most of the research activities were based on 20 replicated field trials that in work package 1 were classified in three categories according starting time: older than seven years, three to seven years, and younger than two years. Four new field trials with reduced tillage and green manures as factors have been set up. Data from field trials and data from literature were collected in work package 1 and used for a meta-analysis on the crop, weed and soil effects of reduced soil tillage under organic farming in work package 2. Analyses conducted reveal that reduced tillage increases soil organic carbon (SOC) content in top soil, resulting in a better erosion control and increased plant available water. Weed infestation was increased by reduced tillage. Yields were found to be 7% lower when reduced tillage was applied compared to the plough system. The meta-analysis stated that weeds were not the main reason for lower crop yield. Contrasting to non-inversion reduced tillage practices, the reduction in ploughing depth increased SOC without increasing weed density and without jeopardising yields. This shows that reducing the ploughing depth is a practice, which can be easily implemented on farms without yield losses. In addition, the lower fuel consumption and less labour and tractor hours in reduced tillage systems may compensate for yield reductions if they occur at all. 159 farmers from ten European countries were interviewed and expressed their views and experiences with reduced soil tillage and green manures in work package 2. The most important motivations of farmers to reduce soil tillage were related to soil fertility preservation, and they saw problems mainly with crop management, machinery and yield performance. Three groups of farmers were identified: "Soil conservationist" farmers were strongly motivated by soil preservation and minimizing environmental impacts. “Agro-technically challenged” farmers mainly expressed agronomic problems and challenges, and were interested in technical solutions to overcome these problems. "Indifferent farmers" group farmers without strong motivations and problems. No-tillage systems were more frequently applied in Southern Europe whilst green manures were more frequently planted in Northern Europe. Combining reduced tillage with green manures is a promising option in the temperate zone to guarantee nitrogen provision and control of weeds. As a case study, soils from treatments of seven field trials were analysed for a previously defined minimum data set in work package 3, which was part of the Handbook of Methods. Soil strata were sampled according to the soil tillage depths in each field trial down to the layer below the plough pan. Carbon stocks were influenced by the form of tillage at all sites in the uppermost soil layer, but were additionally driven by the time of different tillage management and the form of fertilization. Over the whole soil profile, carbon stocks were not significantly different. In depth analyses were based on DNA and phospholipid fatty acids as markers to describe microbial community structure and functions. Effects of the three sites Thil (FR), Scheyern (DE) and Frick (CH) and soil depths as well as different microbial communities under reduced and plough systems were clearly reflected in the analyses. Greenhouse gas emissions were measured at the three sites Frick (CH), Scheyern (DE) and Merelbeke (BE). They revealed mainly event-based emissions after soil tillage and fertilisation, and tended to stimulate higher nitrous oxide emissions in soils of reduced tillage depending on the pre-crop. How far the higher emissions are compensated by soil carbon build-up is matter of current evaluations in climate impact analyses. Weed control may be the most challenging work for organic farmers, who want to implement reduced soil tillage without herbicides, and thus a case study on weeds and crop yield was performed. Based on 13 field trials across Europe, it was found that despite elevated weed density, biomass, and a changed weed community in reduced tillage treatments as compared to ploughing, crop yield was rarely reduced. Where green manure types were tested across the tillage treatments, certain green manure species were found suitable to suppress weeds. 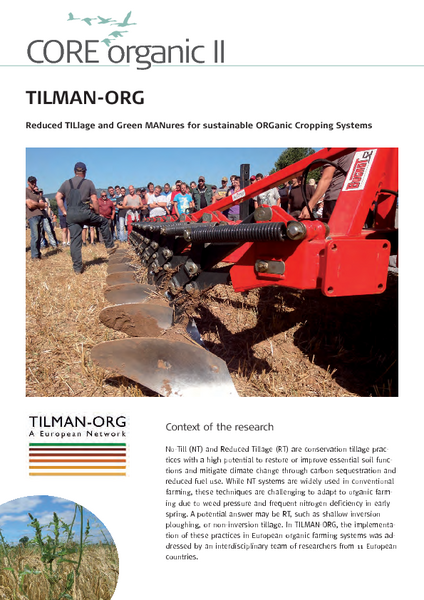 Apart from green manures, an adapted machinery for reduced tillage and weed control was found essential for a successful implementation of reduced tillage in organic farming. Ploughs with an effective shallow soil inversion action (around 10 cm) to control perennials and to terminate grass-clover leys were developed in various European countries in the recent years. For weed control a complete undercutting of the soil surface, e.g. by wide chisel blades, was found essential. Recent developments, like automated camera driven inter-row weed hoeing machines, effectively controlled weeds and drastically reduced labour. Functional traits of 150 weed species were identified and assembled in a database. This will allow evaluating in a balanced way the positive and negative properties of weed communities as affected by various farming systems and agronomic practices. Nitrogen use efficiency and nitrogen dynamics in reduced tillage were analysed in a case study in work package 5 using datasets from nine field trials. Yields were found to be 8% lower under reduced tillage as compared to the plough, which is in line with the findings of the meta-analysis (work package 2). If nitrogen fixing green manures were included in the rotation they were able to compensate for this yield reduction. The effect of green manure on crop yields was positive, but often left a large amount of nitrogen unexploited, and prone to loss. Nevertheless, the effect on nitrogen use efficiency would be better calculated over a whole crop rotation to account for the distribution and carry-over of nitrogen to the crops in the rotation. Nutrient dynamics were modelled with the NDICEA nitrogen planner software based on data sets from five field trials in work package 5. As the model output was unsatisfactory, the model was recalibrated with data sets from TILMAN-ORG field trials, and a new “decay factor” was introduced. Still the model was not reflecting the measured data to the desired precision. Multi-soil layer models are suggested to be more appropriate for no-tillage and reduced tillage systems. Current work focuses on mechanistic modelling using the biogeochemical model DayCent. Results from six field trials, the literature review and farmer interviews were used for a multi-criteria assessment (MASC) and for farm prototyping in work package 6. Conservation of micro- and macro-fauna was found to be improved in reduced tillage and green manure systems. The assessment further showed that problems may occur with respect to weed control, pests and diseases. So at various levels (farmer’s interviews, literature review and case study experiments) weed control was identified a major challenge for reduced tillage systems. No substantial economic problems were identified. A weed module was included in the multi-criteria assessment model in collaboration with work package 3. The two approaches using multi-criteria assessment and in specific cases (C and N in soil) NDICEA were useful to evaluate farm prototypes and the performance of the long-term trials. Weaknesses and strengths of the prototypes with respect to their overall sustainability can be identified. Prototypes could be optimized by fine-tuning specific farming practices. Suggestions were made to calibrate multi-criteria assessment for the parameter soil organic carbon in organic farming systems, because the multi-criteria assessment modelled values were not in line with measurements in long-term experiments.